In honor of World Toilet Day, I am dedicating this post to that beloved institution of French life, Madame Pipi. Also known as la dame pipi, it is a mystery as to why this job is invariably held by a woman. Public toilets, especially clean ones, are much sought after in France, nowhere more so than in cities like Paris. And certainly by no one more than yours truly. 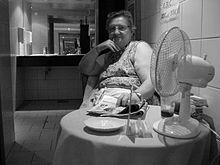 Given my distrust of la Sanisette, I have only the greatest appreciation for the important job of the toilet attendant. Unfortunately, she is a dying breed as automation increasingly takes over. While staying safe and clean, of course! Hygienically yours, that dame’s got clout! Go ahead, take the plunge – leave a comment! And in the gents Monsieur Pipi non? Agree. I always resented like hell paying for access to toilets that weren’t impeccable. Then I saw what the ones that were free looked like! You’d think the City of Paris PR department would improve the ones in the most touristy places for image purposes, but alas this does not seem to be a priority. Who would appreciate clean toilets more than us in India, where even the toilet itself is not available to the majority of the rural population. Believe you me, I regulate my consumption of fluids depending upon how long/far do I have to stay away from the clean toilets identified by me! Madame Pipi, we salute thee, wholeheartedly! Very good point, Supreet! World Toilet Day is no joke, despite my joking on this post. What greater cause on this planet than clean water and proper toilets for all? Thanks for commenting! What a cute poem! I had no idea there was a name for these bathroom attendants–and I certainly didn’t know it was World Toilet Day. Ha! Out of the mouths of babes! Those toilets are an abomination to the female gender. I defy anyone of our ‘persuasion’ to pass water without splash marks! You are now my number 4 daughter’s hero(eine) … she was mortified and announced the loo was a breach of human rights! Excellent poem! The last Dame Pipi i saw was a man, catering for the loos at Montpellier station. He didn’t seem to be interested in much apart from shouting at tourists who hadn’t paid him their 50 cents, having used dirty loos and drying their hands on their jeans. I’m with Osyth on the Turkish loos – brrrr. Interesting role reversal. Maybe they consider it too ‘delicate’ a job for the women? I came here after seeing that you’d liked my Martian fart post. I am sorry to say, that I believe I missed World Toilet Day. As a woman with Crohn’s disease, clean toilets are important to me! I should have celebrated… When I was in Quebec City staying at the Chateau Frontenac on my honeymoon 28 years ago, there were two Monsieur Pipi’s. I was most uncomfortable. Now, having lived in Europe where bodily functions are accepted, I wouldn’t particularly mind. Ha, ha that’s funny about the Monsieur Pipi at Chateau Frontenac – they do things a little differently in French Canada 😉 But it’s true that we are a lot less uptight about things like segregated toilets in Europe – sometimes I’m just grateful if there’s a public toilet at all!